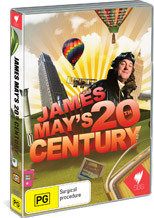 James May's 20th Century is a documentary series hosted by the enigmatic James May who takes the viewer on a tour of the 20th century's most significant technological advancements. Rather than being a dull and dry documentary series, May truly lends himself to these inventions as he sometimes plays the part of how these advancements have "benefitted" mankind. Focusing on a variety of subjects such as flight, video games and even skyscrapers, May truly takes the viewer behind the scenes of these "inventions" and how their creation have assisted, inspired and sometimes hampered mankind. Once again May's humour makes it quite an enjoyable romp through history with his wit, cynicism and charisma. Featuring fun facts and an almost Top Gear style of presentation thanks to May's time on the Top Gear series, if you enjoy a quirky documentary that doesn't take itself too seriously, than James May's 20th Century is the DVD for you. Oh... it's quite educational too!